Thanks to journalist and co-founder of National Geographic´s intranet, Cathy Healy's for her New Storytelling blog mention of ScanMyPhotos.com on Nov 20th. 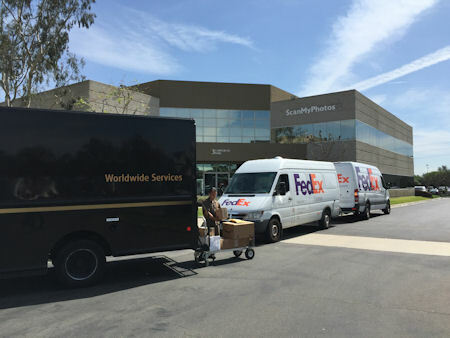 As you prepare for the holiday season, orders from around the world arrive all day long from several courier services and we mandate that every photo scan order be processed and prepare for return delivery the same day it arrives. Whatever the date, please make sure to choose expedited and rush service which means that your digitized photo files and all the extra menu of speciality services that you select will be completed and sent back the same day. FedEx overnight, means that your order will be received back at your residence or office the next business day. Digitize the visuals. Try scanmyphotos.com. My Kansas rebel friend, Gene Carter, says he’s used them twice and they’re “very supportive and flexible.” Also affordable. I have a book of prints, plus a scattering of digital pix, of an ancestor-tracking trip that I did in Ukraine about 10 years ago. That might be an easy way to start try the system.